The Bridge Street unit being marketed for restaurant use. A restaurant could be the first operator to take advantage of the £2.5million street improvement works currently giving lower Bridge Street in the city centre a fresh new look. The former Mays furniture store, which sits at the entrance to the Rivergate arcade, has attracted some interest since going on the market at the end of last year. And Julian Welch, a director at Barker Storey Matthews in Peterborough, the chartered surveyors handling the property, believes that with the nearby Fletton Quays development proposed on the south bank of the River Nene, it makes for an attractive proposition. 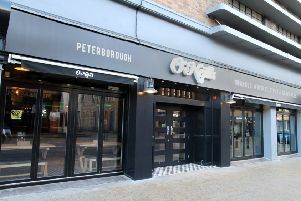 He said: “We have secured planning consent for use as a restaurant or bar, and have specifically targeted those uses due to the prominence of the unit, the fact that it has an entrance directly onto Bridge Street so that it can enjoy trading outside of the normal hours of the Rivergate Centre, and can take advantage of the street improvement works that are now underway. “With the new Fletton Quays development planned for completion in 2018, bringing in the region of 1,500 office workers, a new 400 bed hotel, circa 400 residential units and a new arts centre to the South Bank, footfall along this stretch of Bridge Street into the city centre is likely to improve accordingly, making this an increasingly popular location for operators of this nature. Contact BSM on 01733 897722.